Thiel: Huskies had it in their hands, then . . . Losing 21-16 to Auburn, a bad play call made worse was the pivot point thwarting the Huskies’ breakthrough bid for a win over an SEC powerhouse. By the time of the December reckoning for the 2018 college football season, the details of how Auburn beat Washington 21-16 (box) on Sept. 1 likely will be forgotten by the NCAA playoff committee members and bowl selectors. They won’t be forgotten by Huskies coach Chris Petersen. Professionally, he lives and dies by details: Snap counts, hand positions, check downs, time outs. In the third quarter, down 15-13 in a hammer-on-anvil game in the menacing heart of Southeastern Conference country at Atlanta’s spectacular Mercedes-Benz Stadium, the Huskies had a third-and-goal at Auburn’s 3-yard line. 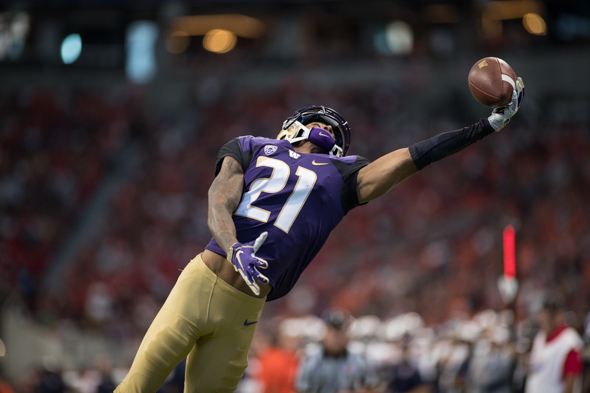 For a tough spot against a premier red-zone defense, Petersen called for an option to the right and a pitch from QB Jake Browning to RB Salvon Ahmed. The missed detail was a defensive overload by Auburn that broke through the Washington line. “They kinda had us out-manned there,” he said. “We didn’t check down; we just ran it. As Browning prepared to flip the ball, DT Nick Poe popped him. The ball escaped behind Ahmed and rolled free until Auburn LB Darrell Williams fell on it at the 20. No six points, no three points, no possession and no momentum in a winnable game. “You know it’s going to come down to that with an opponent this good — every play matters,” he said. “It starts with protection. Then we can’t make bad plays worse. About nine months of preparation went into a moment like this. Then a quality coach and two quality players messed up. It wasn’t the Huskies’ last chance, but it was their best chance to turn into a victory a game that for a quarter looked to be a Tigers rout. Auburn’s vaunted front seven were as advertised — they ended up with five sacks and nine tackles for loss — but a touchdown at that moment likely would have been decisive. After being bludgeoned in the first quarter, the Huskies defense began to control and then dominate an Auburn offense that dazzled early with misdirection and deception. The offense worked past an early Browning interception — as well as the absence of All-America LT Trey Adams, who stayed home with a sore back — to amass 398 yards. When the Huskies finally nudged ahead 16-15 in the first minute of the fourth quarter on a field goal from freshman Preston Henry, then forced Auburn to punt on its next possession, the implausible seemed plausible — a regular-season victory over an SEC team for the first time in Washington’s football history. But Auburn on its next possession went 76 yards in 10 plays, abetted by a 15-yard face-mask penalty on CB Jordan Miller, to go up 21-16 with about six minutes left. When UW’s final possession claimed a first down the Auburn 37, the Huskies again went haywire. After an incompletion, they went backward three times in a row. First, a three-yard loss by Myles Gaskin, then a three-yard sack of Browning. On fourth-and-16, with 1:40 left and two timeouts, the Huskies decided not to try to pin Auburn deep with a punt. Nor did they use a timeout to plot a play. Instead, they abruptly went for it. Auburn’s rush overwhelmed the Huskies’ disorganized protection and blasted Browning, who was penalized for intentional grounding, and twisted his ankle. Game over. Of the earlier fumble by Browning, Petersen warned not to make bad plays worse. Then on the final offensive play, UW made a bad play worse. For the most part, the Huskies acquitted themselves admirably in a hard place. But they didn’t. Now all they have to do is win 12 games in a row to get back to where they were Saturday morning. Actually, they only had two timeouts on that fourth down. They had to burn one defensively in the red zone just before auburn’s go ahead touchdown because they couldn’t get the correct personnel on the field and lined up properly. This was one of those games where no matter which team came up short on the scoreboard, the loser was going to bemoan lost opportunities, of which there were many on both sides. That said, the Huskies acquitted themselves well in a road game against a tough opponent. Anyone who says Washington can’t hang with the big dogs didn’t watch this game beyond the first quarter. I’d take this team into any college stadium in the country believing fully they could win. Lots of season left, and this is a really good football team. Wow – Your looking for the silver lining is impressive. I wish I was able to live in that world, but unfortunately, it does not address Jake the Joke. This team is very, very good on all levels, but Jake will never get to 100% – he is stuck at 90% and has hit is ceiling. If Petersen is to be truly believed, the backup QB’s should start getting snaps IN GAMES, and Jake will be replaced before the season is over. The most popular player on many teams is the backup quarterback. Pretty weak day for the Pac-12 all around. WSU trailed at halftime in Laramie. Oregon fell behind Bowling Green 10-0 early, with the Autzen “faithful” booing their team. UCLA lost at home to mighty Cincinnati. USC struggled against perennial Bottom 10 occupant UNLV. Oregon State lived down to expectations – and then some – giving up 77 points in Columbus. BYU holds a three-score lead in Tucson in the 4th quarter. At least Cal hung on vs. How-are-they-not-on-probation North Carolina. And ASU is walloping something known as UTSA. Stupidity cost them that game, not missed opportunities. The worst offense was taking a touchdown off the scoreboard by the penalty on the unnecessary pick play. Stupidity, lack of execution, missed opportunities, whatever. It’s all semantics. In the auburn locker room, they’re most assuredly talking about how this game should have been put away early. Bottom line, two evenly matched teams slugged it out for four quarters, and each had multiple opportunities to take control. Neither could sustain the respective episodes of momentum to pull away, and ultimately auburn made a couple more plays than we did. I’m frustrated too, but there’s reason for optimism. So tell me all about how Jake the Joke is some great Husky QB – After this game, he has shown he just doesn’t have the “it” factor. If Pounds did not make his “Jerry Rice” level catch of a ball overthrown, then what, another missed field goal? Sixkiller, Moon, Flick, Chandler, Hobert, Brunell, Tuiasosopo, Pickett, Price and maybe Damon huard, all had “it”. Those rose to the occasion and made it happen. Jake just doesn’t have it. And as for his records (stats are for losers, remember), no James QB started more than 2 years because those teams were LOADED and the underclassmen waited their turn. If Jake should have learned ONE THING from the Alabama debacle, it was “throw the F’ing ball out of bounds” – do not eat it. OMG, what’s with this kid, after more starts than any Husky QB in history? I’ll take Hobert’s “brains” over Jake’s any time. Sorry, he just doesn’t have “it”. We won’t see him play on Sundays. I couldn’t care less about the NFL. Jake is a great Husky on and off the field. A total class act. Of course if he keeps this up, he won’t have to worry. He’ll be a successful coach somewhere. Jake did not have a good game yesterday. That being said, he is simply the greatest QB in the over 100 year history of Husky football. The only four year starter, he will end his career with the most wins, completions, yards and touchdown passes. – Until 1972, freshmen could not play varsity ball, so that eliminates all pre-1972 players from being 4 year starters. Sixkiller included. – Beginning 1990, players were allowed to be drafted after their junior year. – James’ teams were SO LOADED, his QB’s only started 2 years, because the next starter was on the bench, learning. So his QB’s typically started their junior year. – Almost all QB’s of quality go pro after their junior year: NO ONE, NO ONE even mentioned Jake going pro last year, as he just isn’t very good. Jake is a good kid and I wish him the best, but he would have been on the bench behind Moon, Sixkiller, Pickett, , Brunell, Hobert, Millen, Price, Chandler, Flick, Tuiasosopo, Damon Huard, and possibly others. I went to my first Husky game in 1959. Browning has won 29 games as a starter. That’s the stat of a winner. As the longest starting period of any QB in Husky history, I would hope he would have the most wins. Let’s revisit this after the season, and if he does great things I will tip my hat. He never will be of the quality of the Husky QB’s that I have personally witnessed and list above. Husky ’72. You forgot about the idiotic wildcat play call at the goal line in the first half too. Just too many bone-headed play calls. Trying to be cute instead of running their best plays in the most urgent moments. Also, Jake Browning is absolutely average. He’s just a guy. Not bad, certainly not great, never ever ever going to take a game over and win it. He proved it again yesterday. The first quarter pick and the final 3rd down sack are inexcusable for a 4th year starter. He can’t throw that pass in the first quarter, and he has to try to make a play at the end. An interception ends it anyways. He’s got to give his guy a chance to make a play. There is zero chance Browning leads them to 12 straight wins. He is the most glaring weakness on this team. I agree completely. Jake doesn’t have “it”, the ability to take over a game. That is often what separates the best from the “almost”. And as to the play calling, it was miserable. I was hoping after Smith left we would see improvement, but these play calls should cost this OC his job. Petersen needs to have the plays come through his headphones, like James did, to override the as he sees fit. Art: Excellent piece (again). You are right— that pitch to Ahmed was the key play in the game. I am a big Jake Browning fan, but he had about a C minus game. How about BYU winning and AZ and UCLA losing? Depends on how you grade. He threw some great balls, evaded some almost sure sacks….but also messed up at key times, aided and abetted by some strange play calls, in my view. So far, last year against Utah is the one and only time he has led the team, trailing, to victory in the closing minutes. Over three seasons. Russell Wilson he ain’t. Still, a hard worker and good competitor. We could do a lot worse. And with the current, eligible QBs on our roster, I’m pretty darn sure we would do a lot worse. So…we hang in there with him now, and see what next year brings under center. It will be interesting to see how Auburn fares against Alabama, who they play on Nov. 24th. This is one of the extremely rare occasions that i’ll root for Auburn.